Hey guys. I picked this up over the summer for $1,000. It's my first 1st gen and I love it. 87k miles, 2.8, 4WD. The previous owner painted it with bedliner which was really disappointing because it looks awful, but the body, frame, and undercarriage has no rust (one super small rust hole on the rocket, I'm guessing someone poked a hole in it or scraped the paint). My goal is to restore it and keep the classic 80's aesthetic while still giving it a slight aggressive look with wide rims. I really wish it was chrome, that was a disappointing, but I really like the guards. But upon closer inspection, one of the frame horns looks like it was broken off and rewelded on. So I won't be getting that fixed anytime soon. I picked up a set of chrome bezel taillights at the junk yard (the ones that came with the truck had overspray on them) for $10 and installed my hitch. Me posing with some local boys. I really needed new headlights. I threw my spare and shovel up on the roof because my rear is filled with tools. I kind of like the look, thinking about getting a roof basket for the tire and building some kind of shovel mount for the basket itself. You can see the crooked bumper better here, and the grill/headlight bezels won't fit in properly. My buddy and I in a mannequin challenge. Murica. That's it for now. I have some American Racing AE39's that are going on in the spring wrapped in some new all seasons and then my next goal is to get a radio for it. After that I want to see if I can find somebody to fix the frame horn. It looks pretty solid. Other than the crappy paint job it seems to be a pretty good buy. Looks pretty decent! Please don't use any neon paint anywhere on the truck lol! Thanks guys! It needs ball joints and an idler arm right now. The mechanic at my job also said the rear passenger side sits lower than the driver side. I'm not sure what is causing that. I'm so over that dark phase of my life, don't worry. Haha. It is the blazer lean. The passenger side always sits lower than the driver side. I though it only affected the second gens. I replaced my spring shackles and springs to fix mine. I thought it only affected 2nd gens too. I know the rear shocks are completely shot, I'm going to start with those. I actually forgot about this one. 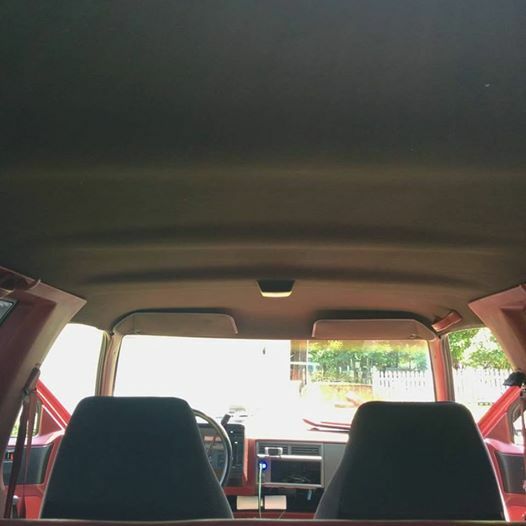 One of my first projects was replacing the dropping headliner, I found this mint one with visors at the local yard. Looking good, you thinking of a tire carrier for this one? I looked into it, and realized it's just too much work. I've been told by other 1st gen owners that you can't do it without cutting body panels inside to make a bracket.